Gift delivered her first foal for SMF in February, a stunning filly by Symbolic SMF. True to her mare family she is a great mother and adores her foal. Quality is the word I would use to describe Divine's Gift and so it continues into the next generation, the fourth for this mare family beginning with Dance Diva. The ability to pass quality forward is like gold when you are breeding and this family is famous for producing both great colts of stallion quality as well as incredible fillies. Just do your research and you will see what I am saying is true. One of my favorites! She has such a "DIVA" attitude and comes by this honestly as her dam and grand dam are both Diva's! Gift as we call her will take a bit to become the beautiful mare that she will finish out when mature and white. She requires the wisdom of a saavy breeder with experience to see what will be. If you want to have a mare in your barn that makes you laugh and look forward to seeing everyday... this is the one! 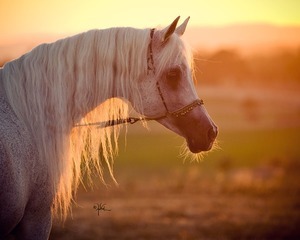 She is the quintessential broodmare and when she is white could also be shown. Great body, incredible movement and a beautiful head. Divine's Gift SMF is a 2011 grey filly with a very exotic head, great floating movement and a personality that will keep you laughing. She is out of the *Simeon Shai+ daughter, Dance Divine SMF and by the homebred stallion, Ali Saroukh. Using Saroukh on Shai daughters or vice versa has been a proven formula for us at Silver Maple. The dam line is Hadbah Enzahiyah tracing to Bint Samiha through *Hoda, a mare imported by Kline Arabians to breed to Talal, the Nazeer son. 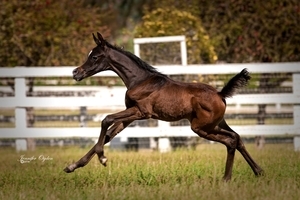 Her grand dam, Dance Diva is a foundation mare for a family at SMF and it is this family that Janice Bush of Somerset farm used to produce Marquis 1. 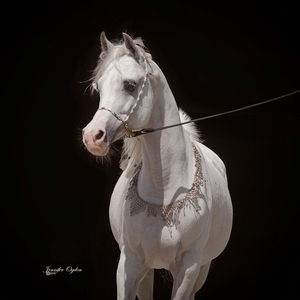 He was purchased by Kehilan Arabians and is one of their two senior stallions and both are sired by Makhsous. This is a mare line that consistently foals fillies, are great Mothers and get in foal easily. All very important trait for a broodmare and best of all she seems to pass this forward. Gift will be an amazing broodmare but also a show mare with her sassy attitude! When she is all white she will be a vision for sure. She is in foal to Symbolic for a 2016 foal.